I guess the real “big surprise” of this tour is that now there’s a show at the Beacon that I actually want to see. Though not exactly superstar laden, “The Big Surprise Tour” features some genuinely interesting and talented acts, I just wonder if this combination of “alt-country” veterans and up-and-comers will be enough of a draw to fill the barn that is the Beacon Theater. On that note, tickets for the Big Surprise Tour‘s August 6 show at the Beacon go on presale today (June 11) at 9AM ET, the password is HESURPRISE. Regular on sale will begin June 12 at 9AM ET. Full press release and more Big Surprise Tour dates after the jump. Born out of a deep running comradery built on countless tours and ties between a host of excellent musicians comes THE BIG SURPRISE TOUR, a traveling show of epic collaboration and good times. Kicking off in Hampton Beach, NH on August 4th, THE BIG SURPRISE TOUR is not your standard up down up down line up. Shows will be composed of two 90-minute sets broken up by an intermission. In a free form ramshackle flow the bands and artists will share the stage, taking part in each other’s songs, resurrecting old standards, and playing newly written collaborative material as they go. Each evening is sure to be a unique experience as they all put their many combined years of musicianship and knowledge of song-craft and American music into play for these sessions. Ketch Secor from Old Crow speaks of the special relationship these bands have and the parts they’ve played in their own individual journey as musicians. “Seven Years ago when Old Crow first met Dave Rawlings and Gillian Welch at the Station Inn in Nashville, we stayed up till dawn singing Stan Rogers songs and playing AC/DC licks. Three weeks later we were making a record. 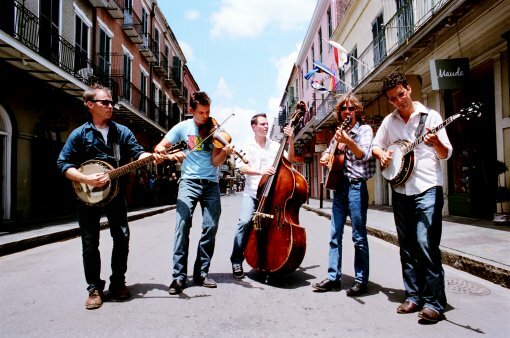 They were that rusted sign at the fork in the road showing OCMS just where it was headed.” With the Felice Brothers as Secor explains it, “with their rockin’ unruliness, we found where we had come from in the first place. Music is a mobius strip, contort all ya want and you’ll keep winding up where you started.” Justin Townes Earle is “looking forward to being on tour with folks that are kindred spirits. We all have similar influences, which will be reflected in the covers we do during the show and our collaborations on stage.” For their part, James Felice reminisces that they’ve “traveled around the country with Justin and Cory (of Justin Townes Earle) playing some pretty bizarre gigs. We couldn’t love those guys more.” “As for Old Crow”¦” he says, “they cleaned us out playing dice more than once.” Perhaps they’ll get a chance to even the score on these dates. Borrowing from the title of a Felice Brothers track, THE BIG SURPRISE TOUR will live up to its namesake. As Secor states, the audience should “expect the unexpected!” “Music is wild and not tame” he says, and with this tour the artists involved hope to fully unleash the true and unpredictable spirit of creativity. Heaven knows that combined they have a wealth of it to draw from.